When you visit, we will do our very best to give you the service you expect and more. Once you have made a purchase, you will receive any necessary after sale support, including help if you need any alterations to your gun. Everyone’s potential purchase is different, so we will spend time to ensure you leave with what best suits you and your needs. Guns, ammunition and clothing can be confusing, but you can take advantage of our expertise to be confident in your decisions. 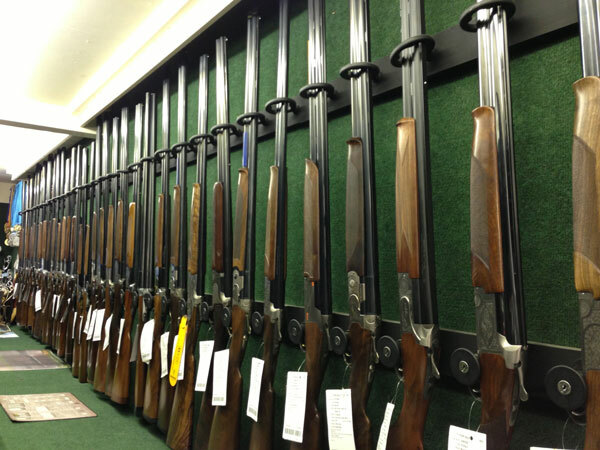 On the ground floor you will find our Gun Room. There are a wide variety of new and second-hand shotguns to suit all levels of interest and all budget requirements. Well-known and trusted names, such as Beretta, Browning, Miroku, Winchester and Caesar Guerini are always in stock, but you will find a number of other sought after guns. Sako, Tikka and CZ form the main basis of firearm rifles and we can arrange your package to include scopes and moderators. We have spring to pre-charged air rifles from BSA, Stoeger, Weihrauch, Gamo and Crossman. A number of Umarex pistols are kept in stock. To complete your needs, we carry performance cartridges (Gamebore, Eley, Hull, Express) and rifle ammunition from Winchester, CCI, Sako, Federal and Hornady. For your air rifle there is a huge choice of pellets. Every accessory for cleaning, storage, safety and participation is available.